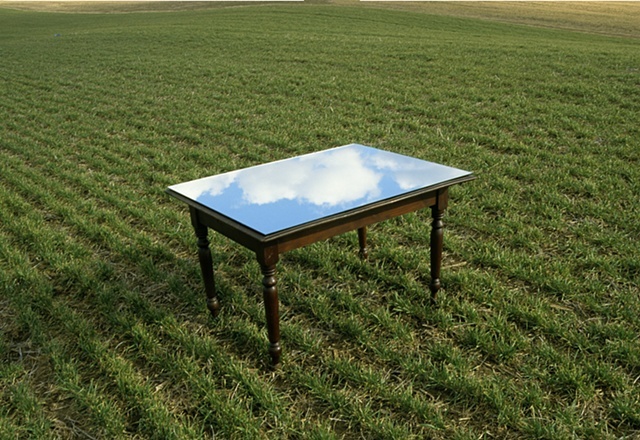 "Sky Table I" is part of a series of installations that are built in a variety of fields, and created with tables often found in Midwestern farm households. Sites are chosen in at risk agrarian environments on the cusp of losing their farming function and threatened by new development. The tables as object, reference gathering, conversing, and serving, and together with site-based materials, act as containers, wells, or platforms that capture monumental ephemeral conditions. These sculptures are exhibited both as site-specific installations and as large scale documentary photographs.